"They get the chance to get off-leash and run around and play with other dogs," says Rebecca Ruch-Gallie, DVM, of Colorado State University Veterinary Teaching Hospital in Fort Collins. "It keeps their weight down, their muscle tone up. It keeps them social. It's huge." The downsides? Your pet mistakes a person's leg for a tree, or he gets hurt and needs to go to the vet. Take these steps to avoid an embarrassing scene or an injury. 1. Take charge. Your dog needs to know that you're the alpha animal all the time. That’s key when other canines are around. Teach your pal to come to you when called. Use a word or phrase he’s not likely to hear at the park. Reward him with extra-special treats during training. 2. Pause before you enter. A well-designed park will have a double entrance with two gates. Don't whirl through both gates at once. Enter the first gate with your dog on a leash, then pause to look around. If there are 20 dogs swarming the gates or if there’s a scuffle going on, this isn't the time to barge in. A pause will also allow other pooches to get used to yours and not go hyper when he does come in. 3. Pay attention. Once inside, it's your job to keep an eye out for the dogs, not other humans. “Dog parks are really awesome, but they're not about human socialization," Ruch-Gallie says. Always know where your four-legged friend is and what he’s doing. If you see trouble brewing, call him back right away. Know when your dog has pooped so you can scoop, too. Many parks provide plastic bags, but it can’t hurt to take your own. 4. Read the signals. Not only should your dog play well with others if you plan to take him to the park -- you need to be able to read canine behavior, too. Dogs at play have relaxed ears, wagging tails, and may "play bow" with their front end down to the ground. Upset hounds hold their tails at half-mast or between their legs. Their ears are pinned back, and their pupils shrink so you can see the whites of the eyes. A dog that’s ready to rumble will be tense, hold his head high, and will lean forward. His ears will point up or forward, too. While growls are common in play, snarling with lips curled back isn’t. If you see these danger signs, redirect the dog with treats or a toy, Ruch-Gallie says. You can also clap or make a loud noise. Use treats and toys only when needed in a dog park, in case they spark trouble. If they go at it for more than a few seconds, try to squirt them with a hose or water pistol, or use a long stick to push them apart. Don't step in with your hands or body. If they’re still fighting after about 3 seconds, you and the other owner should approach the dogs from the rear. Gently grab their back legs at the top of the leg and lift them up like a wheelbarrow then start moving back. Don't reach for the collar. Your dog could bite you by reflex. 6. Don't take puppies to the park. They can be hard to control. People find them cute, but older dogs often think they’re a pain. Plus, those who haven’t yet had all their shots can be exposed to diseases. Wait until your pup is 6 months old before you go. "[The dog park] is not a place to learn socialization, but it's a good place to be social once they've learned," Ruch-Gallie says. Is what the ASPCA calls a "dog dork." These are dogs that just don't know how to interact, no matter how hard they try. Other canines may find them just as annoying as puppies. Rebecca Ruch-Gallie, DVM, service chief for community practice, Colorado State University Veterinary Teaching Hospital, Fort Collins. 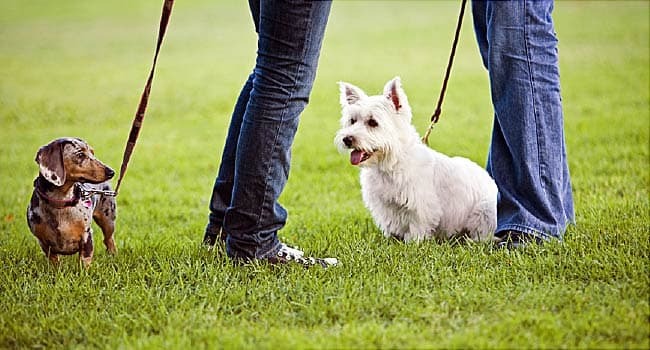 American Society for the Prevention of Cruelty to Animals: "Pet Care: Teaching Your Dog to Come When Called," "Dog Parks," "Dog Park Etiquette 101." The Humane Society of the United States: "Dog Parks and Their Benefits."